Jätte bra Service och grymt duktig frisör som fixade perfekta klippningen för jul och nyår! I have been to Salong Baresso twice, and I can honestly say that the staff there are very friendly and take care of customers well. But with that said, I will never, ever get my hair done there again. To understand why, look at the picture (collages) I uploaded. I booked an appointment at Salong Baresso to get balayage, showing the picture below. I got my hair done with Nina, who was very friendly and kind. The whole process took 4.5 hours. When Nina fished, my hair didn't look balayaged - it simply looked blonde, but still dark on top of the head. However, I didn't see the back, just from the friend and sides, and I had been there so long that I chose to go home at that time and not mention it (my first mistake). 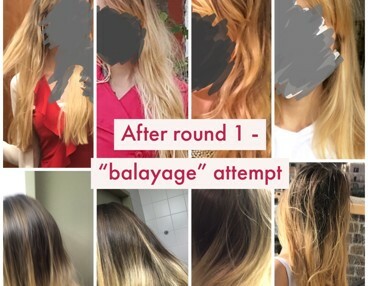 Over the next few days I realized that there really was no balayage or blend - I was simply blonde on the lengths and brown up top on the back of my head. It looked like I had bleached my hair long ago and was letting it grow out. But life was crazy at that point and though I meant to go back and complain, I didn't get around to it (my second mistake). But over time, as it started to grow out a bit, it just looked worse and worse, and I started always wearing my hair clipped up so that no one would see the harsh line where the colors separated. This would not have happened if it had been balayage with a nice blend into the natural darker color, but it was just a bad dye job.It looked so bad that I decided to contact the salon to give them a chance to fix it - even though it had gone almost three months at that point. I sent pictures to Luci at the salon, who said that normally you have to complain within 7 days for them to do anything about it - which is totally fair. But he saw the problems with the job they had done and kindly offered to fix it for free. We agreed that he would fix "the blend" and get rid of the harsh line, adding a few lowlights as well to make sure it all melded together. When I arrived to the salon he also recommended taking the blonde "a little half step darker", something he said would barely be noticeable but would help it blend. He seemed very thorough and competent, discussing what I liked and didn't like about how it turned out, and asking me about whether I preferred warm or cool tones. I told him I prefer warm (as my hair was already), because my skin tone is warm. He seemed to understand. But after 2 hours when he began blow-drying my hair, I started to panic. My hair was a cold, ashy, greenish-gray color. 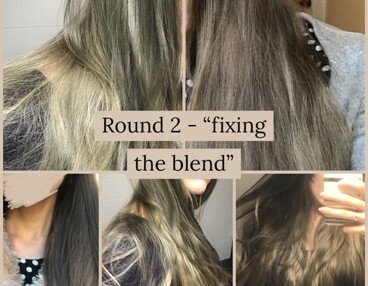 It was well-blended, sure - but it certainly wasn't anything like either the photo I had showed or my natural (warm) color. It looked strange and off. Luci told me to give it a week, saying much of the grayish color would wash off. And much of it, although not all, did - but only because I washed my hair every single day, multiple times a day, for a week with clarifying shampoo to strip it off. Thanks to this and to Revlon Nutri Color Creme (in pale gold), my hair is finally starting to look a bit more normal and regain a warm tone. I have informed Luci that I am not happy with the result, and he has said that the company is not responsible for any fixes at this point, but that he could give me a discount on fixing the warm tone. And I think that is kind of him; the staff has always been kind, as I have said. Again, all the staff have been very friendly. They are nice people. And for that I give them two stars. Nya salong Baresso, jätte fräscht och bra service ! sjukt nöjd med min keratinbehandling och klippning!